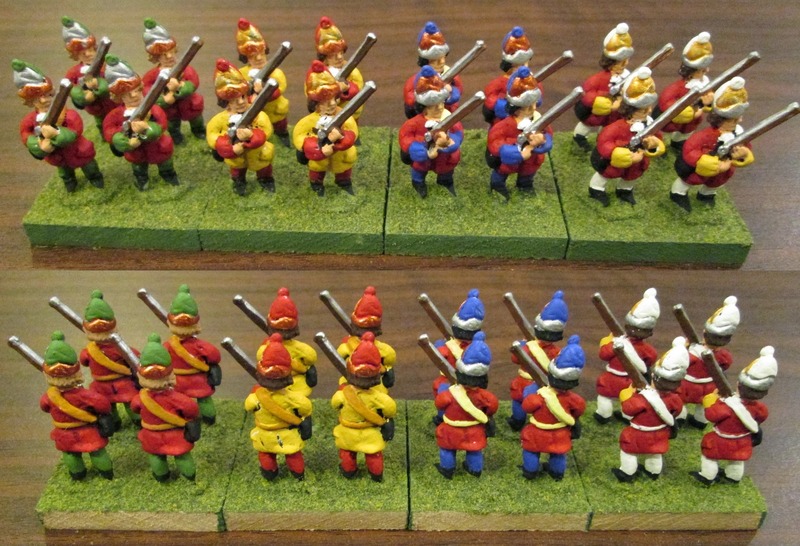 In my post on re-flagging my Saxe-Bearstein army I mentioned Grenadiers and Irregulars. Today I'll provide a few photos to give some idea as to what they look like. Here is an example of what some of my "converged grenadiers" might look like (both from the front and rear). Oh, and if you are curious about the yellow-coated figures, they are from my "Pioneer" battalion. I should point out, by the way, that these photos were taken with a brand new (for me) digital camera (since my old one had given up the ghost, I bought it yesterday). It isn't fancy (under $80 Canadian at Staples), but I'm pleased with the value for money. It is a Canon Powershot A1400. By the way, for those who might be curious about the figures, the entire Saxe-Bearstein and Stagonian armies are all 25mm Blood Axe figures, sculpted by Lance Runolfsson and currently available from Historifigs (although I don't think they are all listed on their website yet). I like the look of the figures, both the sculpting style and your paintwork, and the basing. There's a wonderful toy soldier look to them. The way you differentiate the irregulars from the line infantry by the arrangement on the bases works very well. It's easy to see the difference, and they each look "right" when arranged in formation, too. Jolly colourful Jeff. Good score on the new camera.